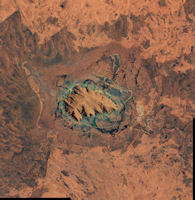 Uluru (Ayers Rock) is an inselberg, or island mountain. 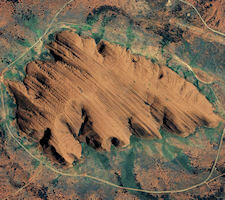 Ayers Rock is altogether so remarkable a natural object. In the heart of the Australian Outback, a massive block of red sandstone rises up out of the near-perfect flatness of the eroded landscape. 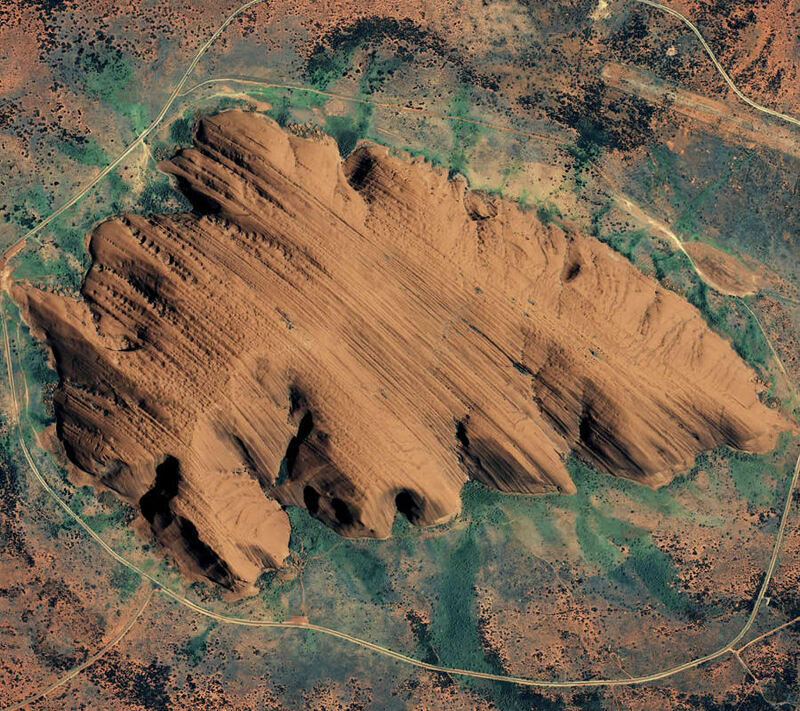 Called Uluru, or Ayer's Rock, this giant is a monolith 348 meters (1,142 feet) high, 3.6 kilometers (2.2 miles) long, and 9.4 kilometers (5.8 miles) around. It is the largest single rock known in the world. Tourists come from all over the country and the world to watch sunrise and sunset bring the colors of the rock to life. Some also make the challenging ascent to the top, despite the disapproval of the local Aboriginal people, to whom Uluru is a sacred site. In the same year (1873), Mr. W. Gosse was dispatched on an exploring expedition to the westward, in the course of which he discovered that very remarkable rock, which he named "Ayers' Rock", after Sir Henry Ayers. The top is covered with small holes in the rock, varying in size from 2ft. to 12ft. diameter, all partly filled with water. 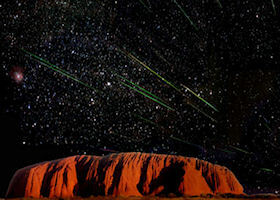 Ayers Rock is a high mass of granite, the surface of which has been honeycombed, and is decomposing, two miles in length east, and west, and rising abruptly from the plain. The soil around the rock is rich and black. This seems to be a favorite resort of the Aborinines in the wet season, judging from the numerous camps in every cave. These caves are formed by large pieces of the main rock falling to the foot. Rising like an enormous water-worn boulder, half buried in the surrounding sea of sand hills, is that remarkable monolith known as "Ayers' Rock." Its summit can be seen more than forty miles away, as it rises about 1,100 feet above the surrounding plain. The circumference at its base is nearly five miles, and its sides are so steep as to be practically inaccessible, although early explorers succeeded with great difficulty in ascending it. It is quite bare of vegetation, except a few fig trees growing in the crevices. This grand old monolith, weather-beaten and scarred by the storms of countless centuries, stands to-day, after defying the eroding influences of frost and heat from time immemorial, looking out like a majestic sentinel of the plain watching the signal fires of the Aborigenes who converged from all points of the almost limitless desert beyond, and steering for the narrow oasis at his feet, where is to be found the only permanent water in this desolate region. This is one of the most remarkable natural features of the Australian continent, and is probably the largest monolith known. It is composed of metamorphic grit of a bright red color, set off by the green bushes surrounding it. For a short distance round the base there is a narrow oasis watered by the drainage from the rock; beyond that the sand extends in all directions. It might almost be said of this, as of the Pyramids or the Sphinx, round the decay of that colossal rock, boundless and bare, the lone and level sands stretch far away. Ayers Rock has undergone remarkable management transformation. In 1959, experienced bush pilots would bank their single-engine planes tightly around the large rock monolith and turn the aircraft so that passengers had a scenic view of the deep erosion in the red sandstone, just before touching down on the desert landing strip at the base of the massive formation. Thousands of other tourists would follow over the next 25 years, many of them climbing the trail to the top of the monolith and staying in commercial lodging at its base. 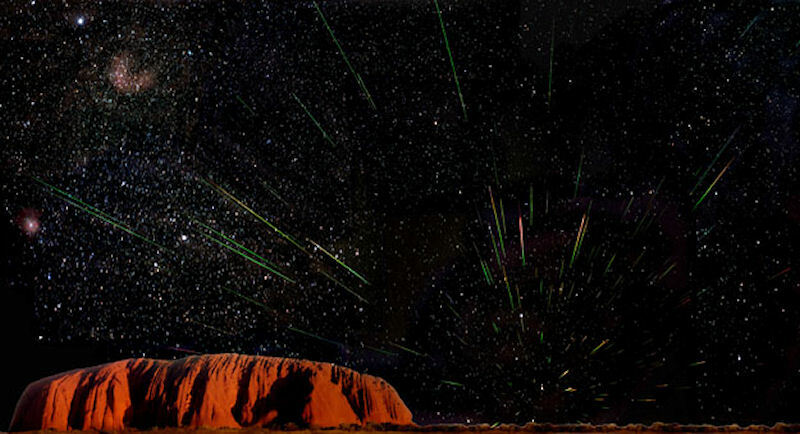 In 1985 the land was returned to the local Anangu people and then leased to the government as a jointly managed park, known today as Uluru-Kata Tjuta National Park. 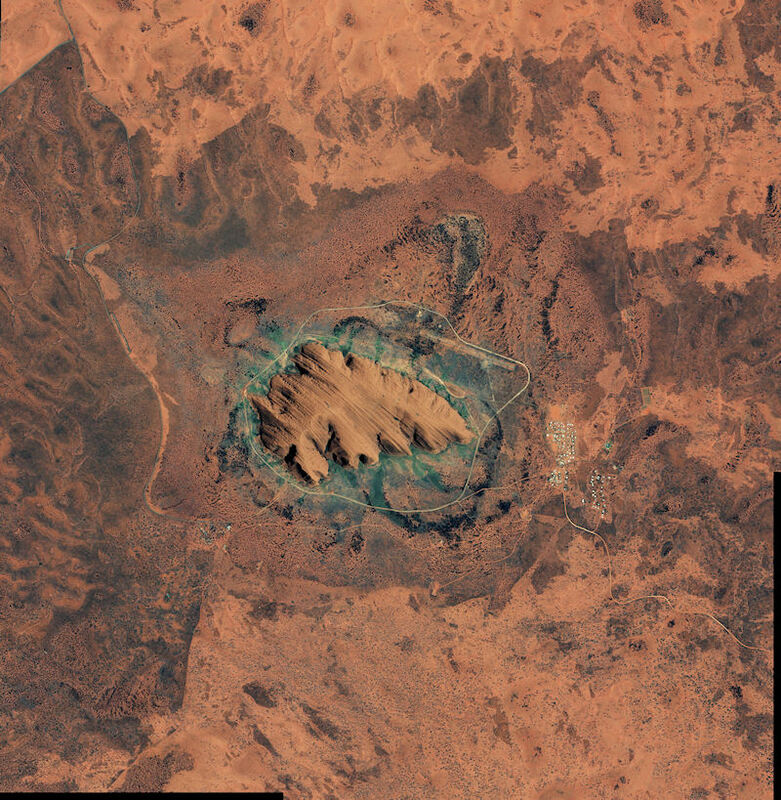 Out of respect for the spiritual significance of Uluru to the Anangu people, the airstrip and lodgings at the base of the monolith have been replaced by a modern airport and Yulara Resort outside the park, but the airstrip is still visible in satellite photos even though it is unused and covered with scattered desert flora. Commercial jet aircraft deliver tourists to the new airport, and as they engage in the popular activity of viewing the sunset over the rock formations, noisy helicopters fly other tourists over the terrain. Climbing the formation is still permitted but discouraged, also out of respect for its spiritual significance. In what would come as a surprise to many in park management in other parts of the world, the nearby visitor center at Yulara has a display actually encouraging tourists to take a helicopter tour of Uluru rather than climb it, again as a sign of respecting its spiritual significance.